I use both Outlook and Apple Mail. One of the primary things I need to be able to do is have a better search experience for mail. However I’m finding that while there is a category for “Messages & Chats” nothing is getting indexed in this category. I’m I misunderstanding DSE’s features and capabilities or do I need to perform additional configuration to pick up the messages for indexing? 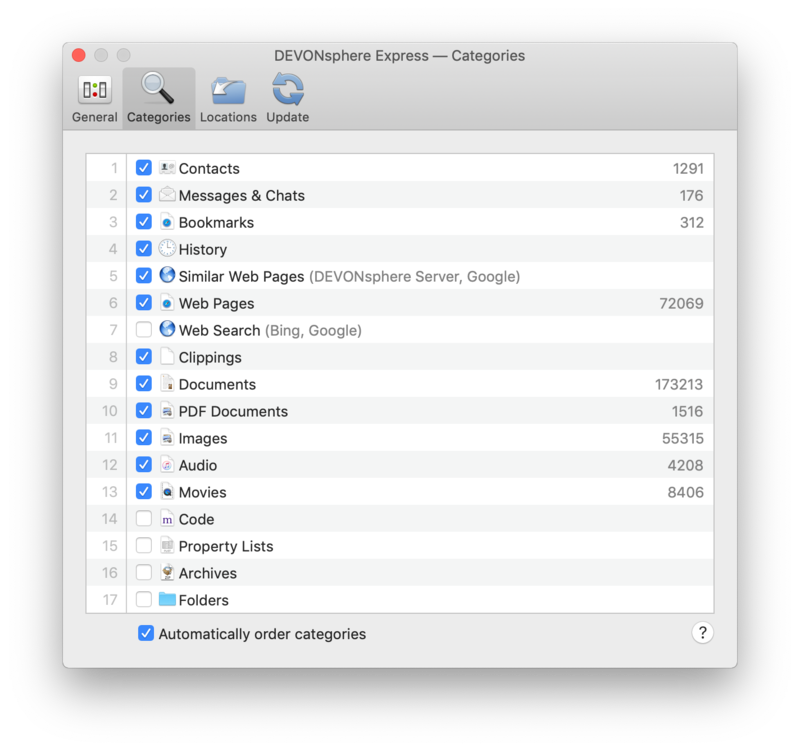 Have you enabled Full Disk Access for DEVONsphere in System Preferences > Security & Prviacy > Privacy? I’ve tried this and then reindexed… It says it’s indexed 176 messages and chats. That sounds more like iMessages than email. If it were indexing emails I’d expect hundreds of thousands. I’ll note that it seems like by default it’s not indexing the location on disk where Mailboxes live, so not sure if that has something to do with it, however not sure how it would index encrypted mail. If it were indexing emails I’d expect hundreds of thousands. Hundreds of thousands, literally? And how many would be encrypted? In DEVONsphere Express, click the Action menu (gear icon), hold the Option key and select Help > Report Bug to start a support ticket. Probably about 5% are encrypted. Note “Mail” is “~/Library/Mail” everything else is default. Actually, it’s not. You have added your Home directory and you should not do this. You also shouldn’t explicitly add the Mail directory. I only added the Mail directory as it seemed like it wasn’t indexing any emails. My home directory was there. Unfortunately I was on holiday, and now my trial expired - so I’m not able to continue this evaluation unless there’s a way for be to extend it. And unless I can get it to index emails, it’s almost a completely useless product for me.